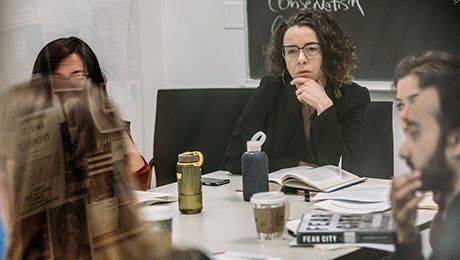 The 30-credit MA in Liberal Studies is decidedly interdisciplinary, ideal for students whose intellectual interests cross departmental boundaries. Equipped with the ability to investigate social and cultural issues from a holistic perspective, our graduates pursue a wide variety of professional and academic careers. Every Liberal Studies MA student is assigned a faculty advisor, who helps students clarify their research interests and take advantage of the educational resources available at The New School to design a program of study that meets their needs and goals. Many graduates of the MA in Liberal Studies enter PhD programs at The New School for Social Research or at other top universities, and others pursue professional paths in teaching, journalism, cultural organizations, government, and other fields. A full account of degree requirements and procedures is contained in the Liberal Studies departmental handbook. To earn the MA in Liberal Studies, a student must complete a total of 30 credits with a minimum grade point average of 3.0. Apart from the required courses, students can choose from a wide range of course offerings approved by the Committee on Liberal Studies to promote interdisciplinary expertise and an independent approach to learning. The faculty is particularly strong in the four areas of study described below, but students are free to take any combination of approved courses they desire. Students with an interest in word, image, and culture will find a broad array of courses in literature, cinema, visual art, gender and sexuality studies, and aesthetic theory. Some courses focus on a particular writer, artist, or time period; others take an integrated approach to aesthetic movements or topics. Courses in this group enable students to develop competence and facility with the ideas that shape our history and our times. Some courses examine historical perspectives; others look closely at the intellectual life of the modern period. The means by which thought and art are communicated with the public is constantly changing. Courses in this area address the history of means of communication and their current and emerging forms. These courses offer not only practical instruction in current cultural media but a context within which to understand the shifting terrain of media forms. The slow eclipse of traditional print and broadcast media raises questions about the nature of media in general and its influence on culture, politics, and daily life. Courses in this area cover both the classics of media theory and pressing questions in contemporary media and culture. A written thesis is an opportunity to explore and critically analyze a text or set of texts, period or contemporary, in a way that sheds fresh light on the subject and/or transcends established disciplinary boundaries. A completed thesis is a significant body of work that can become the foundation for further research and writing, including a doctoral dissertation, or the first draft of a work intended for publication. Students begin working with their faculty advisors in their first year to develop ideas for a thesis. They decide on a topic in the first semester of their second year. In their final semester, students write the thesis and present it to the faculty for approval.